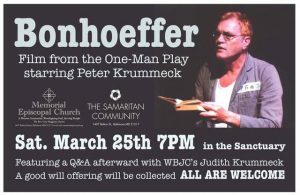 Bonhoeffer, a film of a one-man play, was screened Saturday in the sanctuary at Bolton Hill’s Memorial Episcopal Church, in Baltimore, MD. The film starred the late actor Peter Krummeck, who also produced the play. He was born, in 1947, in Johannesburg, South Africa. He died in St. Luke’s Hospice, Cape Town, South Africa in 2013. Archbishop Desmond Tutu was one of the patrons of Krummeck’s Cape Town-based African Community Theatre Service. Bonhoeffer, the play, originally debuted in Washington, D.C. in the early 2000s. It also was performed in Canada, South Africa and at Baltimore’s Theater Project. It was televised in Canada. Backstory on Dietrich Bonhoeffer (1906-45). He was a German Lutheran pastor, theologian and author, who opposed the Nazi regime. He was active in the resistance movement and in a plot to kill Adolf Hitler, the German dictator. Bonhoeffer was arrested in April, 1943, and jailed at Tegel prison. He was subsequently hanged by the Nazis — at Flossenburg — just weeks before WWII ended. The program was hosted by The Rev. Grey Maggiano of Memorial Episcopal. After the presentation of the film, John Kiess, Theology professor at Loyola College, The Rev. Dr. C. Anthony Hunt of United Methodist Church, Senior Pastor, and Judith Krummeck of classical radio station WBJC, participated in a panel discussion. They each shared their views on Bonhoeffer. A spirited Q&A from the audience followed. 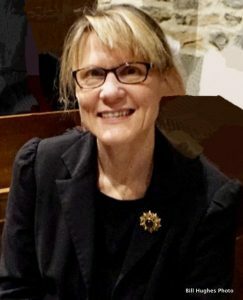 In her remarks, Krummeck, a sister of Peter Krummeck, talked about the background of her brother’s work, especially in the area of the role of theater, and the church, too, in “promoting social justice and reconciliation.” She has been the popular “evening drive time host” for WBJC, since 1998. Krummeck is a native of South Africa. She is also an actress, educator and author. Her latest book, Beyond the Baobab, is a collection of essays about her immigrant experience. I must add that I thought Peter Krummeck’s portrayal of Bonhoeffer in the 45-minute edited film version of the play was simply riveting. He captured the essence of the doomed, but courageous cleric. Bonhoeffer’s martyrdom was also depicted in a well-received documentary on his life and death. It was produced, in 2003, by writer/director Martin Dobimeier. A lively discussion of the importance of Bonhoeffer to our contemporary era came up. Rev. Hunt mentioned Martin Luther King Jr. and Bishop Oscar Romero as just two of the modern day spiritual leaders/martyrs, who were guided in their struggle for Justice by their abiding Christian faith. He added there were also many more “unsung heroes” for the cause of Civil Rights in America. Dr. King was murdered in 1968. Bishop Romero of El Salvador was a champion of the poor in his beleaguered country. Siding with the poor, however, was considered a “subversive act” by the blood-stained Oligarchy running the regime. He was killed in San Salvador by the death squads in 1980, while serving Mass. Professor Kiess, who is an expert of the writings of the Jewish intellectual and historian Hannah Arendt, raised some relevant comments about the moral duties of an individual, when facing “evil.” Arendt penned, in 1963, the controversial book, Eichmann In Jerusalem: A Report on the Banality of Evil. Kiess’s book, published in 2016, is titled: Hannah Arendt and Theology. It needs repeating that the widespread resistance by many heroic Christian clergy to the Nazi regime, during the blood-stained days of the German Reich, isn’t well known. The records, however, of the Dachau concentration camp, located in the South of Germany, near Munich, tell, in a compelling fashion, some of their story. According to a finely-detailed book, And Who Will Kill You, by Bedrich Hoffmann, Pallottinum, (1994), the author revealed that “2,670 members of the clergy” passed through the Dachau hell hole during WWII. Of that number, “621 died” there for reasons that aren’t disclosed. Roman Catholic priests, 598 to be exact, made up the majority of the 621 clerics who perished at Dachau from 1934-45. Finally, I think one of the consensus from tonight’s viewing of “Bonhoeffer,” was that the play, and the important moral issues that it raised, is just as relevant today as it has ever been.